Hampton Roads Termite and Pest Control Inc. is fast approaching its 30th year in business. Started by Principal owner Wayne Bradshaw and Michael Old in 1986, both grew up together locally in the Great Bridge section of Chesapeake. Both have a strong bond to the local and Hampton Roads area. It’s been important since the days when the business first opened to provide a personal service to our customers which reflects our local business feel, no matter how large we have grown. Because we have purposely kept ourselves in close proximity to our customers we can do things like set our inspection times on the hour instead of showing up “sometime tomorrow”. All of our inspectors, technicians, repairmen and pest control operators are highly trained and keep up with the latest technology and trends in the business. Your home is your most treasured asset. Protecting that asset is our mission. Over the years we have enjoyed and been proud of the trust we have developed with our customers. We welcome the opportunity to help safe guard future homes for generations to come. Please call for free inspections. Daniel always does an excellent job. He’s so nice and professional. 17 years of fine customer service. The technician, Wayne Bradshaw, was very personable and knowledgeable. He did an excellent job. You should be proud of him. HRT&PC has provided service to us for over 20 years. They honor the warranties, are reasonable, timely and courteous. The technician showed up at the scheduled time. He was very professional and thorough. He took time to answer all of my questions and offered me suggestions on how I could keep pest out of my house. I was very pleased with my service and look forward to next years inspection. B. N. of Chesapeake. Consistent excellent service year after year; almost 20 years. As always your tech was on time, courteous, and efficient. You folks take care of my home and rental condo. I have never had a complaint, in fact I have always been more than pleased with your techs and their work. Tks George. We have had a long term relationship with Hampton Roads Termite and Pest for our pest control. They are reasonable, responsive and have given great service for at least the last 5 years. Hampton Roads Termite and Pest Control inspectors are amazing. Not only do you look for critters, you provide me feedback on how my house looks from below. You are my eyes under my house, and I am most grateful. You've changed out insulation for me at a great price. You have my trust. Hampton Roads Pest Control, thank you for the excellent care that you have given our home to keep it safe from termites and pest. We had a new crawl space moisture barrier installed about year ago by Hampton Roads Pest Control. It was done by today's standards for the state of Virginia. Our crawl space was dry and no signs of termites for our annual renewal inspection. I have been a customer of Hampton Roads Termite & Pest Control since 2003. They have always been efficient and customer service friendly. Prices are very reasonable. I will never use any other company. The are always reliable, knowledgeable & through inspections. Very friendly work staffin both the office & in the field. Out tech was knowledgeable and very friendly. He even showed up early for our appointment. Have yet to disappoint in any capacity or be late to a scheduled appointment— which for us is key considering we have to take off work for service appointments. Recommend. Always on time and always professional. Paul Fischer is a wonderful techician! Termite inspector was able to come earlier than scheduled and got our inspection done while I had other servicemen working on my house. Win Win situation. Prompt and pleasant technician. Always friendly employees have come to my house. Very professional and always on time for our annual inspection. Excellent job and responsive actions. They do what they say! Well satisfied with your service. Appointments are easy. Your man showed up on time and didn't take a lot of time with the inspection. I have been a customer of Hampton Roads Termite & Pest for about 7 years and have been very satisfied with the service. The technicians are knowledgeable, respectful and arrive on time. They get the job done!!! I highly recommend the service and have referred several people. Great service! Great personnel! Been with you all since 1999. Recommend you often. Thanks! We've used Hampton Roads Termite & Pest Control for 10 years now. No complaints. Highly recommend! Willie is professional and personable. Been with Hampton Roads Termite since 2007, would recommend to anyone. very professional, on time, did a great job, explained what I have to do if the problem continues with the bugs. Shannon is great about scheduling. Jeremy is pleasant, professional, reliable, hard working, informative. Couldn’t ask for more. Always on time and thorough...very professional. 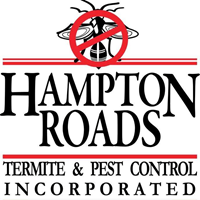 Hampton Roads Termite and Pest Control is a great company... they make it easy to set up appointments, they are friendly, and they stand by their work. I would recommend them! HRTPC is very dependable and professional. Good service. The Rep. Offered some good advice.